Salads to increase your Calcium intake! high calcium salads. high calcium raitas. Bored of the same old vegetable salads and boondi raita. Well, bid goodbye to the standard options, with this all new range of Salads and Raitas. Brimming with calcium-rich ingredients like chick peas, rajma, sprouts, paneer and lettuce, these recipes will provide a colourful, crunchy and peppy way to boost the calcium content of your meal. Our favourite is the Masoor Beet Salad which is a meal itself. Then for work you can make a Kale Masoor Salad which is a great Antioxidant. Then we have used whole Kowar to make Jowar Kale Palak Salad which will provide Iron, Vitamin C, Magnesium and Omega 3 Fatty Acids. Curd is available in every Indian household and is used for Breakfast, Lunch and Dinner. The Palak Raita goes really well with Aloo Paratha. The Hyderabadi Burhani Raita with Bidari Paratha. There is the Flax Seed Raita and Curd with Cocoa Powder. Both are made with full fat curds which provide energy and keep the Athlete fuller for a longer time. The addition of Flax Seeds and Cocoa Powder are 2 super ingredients. Enjoy our collection of high calcium salads. 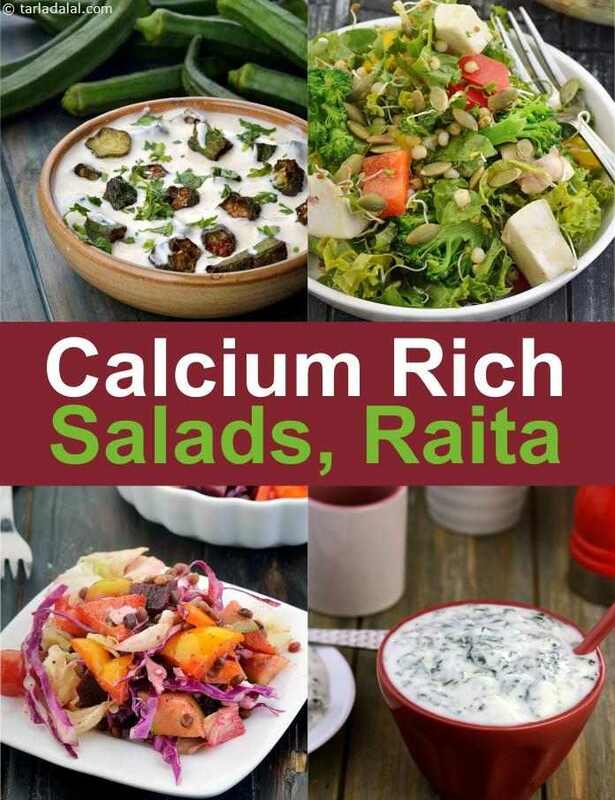 high calcium raitas given below from Calcium Rich Breakfast to Desserts.